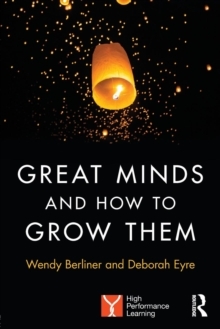 Great Minds and How to Grow Them is a handbook for parents that shows how they can grow the minds of their children and teenagers and guide them to success both at school and in life. The latest neurological and psychological research is proving that most children are capable of reaching high levels of performance that were previously associated only with the gifted and talented. Brains are malleable and IQ is not fixed yet, without parental engagement in their learning, many children don't reach the levels of performance that are associated with academic success. Combining new knowledge with extensive research into how we learn, this book proves that by using simple, everyday techniques that are both rooted in research and accessible for parents, children can learn to learn more successfully. There is room at the top of the class for many more children than we ever thought possible. An engaging collaboration between a world-class academic and an award-winning journalist, this inspirational book includes chapters on:how to develop a good home learning environment;how to make the most of school;how to develop values, attitudes and attributes that are associated with success at school and in life;how to develop thinking and learning skills in the three ages of learning;how to tackle potentially tricky areas like homework and adolescence. This practical guide will be essential reading for parents, teachers and all those interested in helping children and young people to reach their full potential.